Mr Spencer commenced duties as APL’s CEO in 2005, after a 20-year career in agribusiness, both in Australia and internationally. A large part of that time was spent in the agricultural chemical industry where Mr Spencer held marketing and general management roles in Australia, Germany and South Africa. In 2000, Mr Spencer moved to France to work in the agricultural biotechnology and seeds markets, particularly in global cotton, canola and rice cropping segments. Andrew comes from an agricultural upbringing. His family had cattle, sheep and cropping farms, resulting in his choice to complete a degree in agricultural science. Dr Campbell is CEO of the, CRC for High Integrity Australian Pork, which commenced in July, 2011 and is positioning the Australian pork industry and its products as high integrity, welfare optimal, premium quality, safe, nutritious and highly sought after. Based at University of Adelaide’s Roseworthy Campus. he was also CEO of its predecessor, the CRC for an Internationally Competitive Pork Industry, which commenced in 2005. From 1972 to 1988 Dr Campbell was a research scientist at the Victorian Department of Primary Industries at the Animal Research Institute, Werribee. In the mid-80s he spent a year as a visiting scientist with the US Department of Agriculture in Beltsville, Maryland, doing world leading research, including on the effects of exogenous growth hormone on energy and protein metabolism in pigs. He spent a decade as general manager, technical services at Bunge Meat Industries, Corowa, NSW, then Australia’s largest integrated pork production company. From 1999 to 2005 he was back in the USA, as CEO of Ausgene, a genetic technology company in Bloomington, Illinois. He was also a member of a research and innovation team for United Feeds, Sheridan, Indiana. Heather Channon is currently Acting General Manager – Research and Innovation at Australian Pork Limited. Heather has worked for APL since 2005 in various roles within the Research and Innovation Division. Her areas of responsibility have included the management of R&D programs in food safety, product traceability, processing and product innovation, production, meat science and carcase composition and the implementation of these research outcomes by industry. Heather is currently completing her PhD at The University of Melbourne with her PhD program focussed on developing an eating quality system for the Australian pork industry (with support from both the Pork CRC and APL). Prior to this, Heather was a Research Scientist (Meat Science) with the Victorian Department of Primary Industries, Werribee from 1995-2005. In this role, Heather conducted many research projects to understand the impact of processing and post-slaughter factors on pork quality attributes. 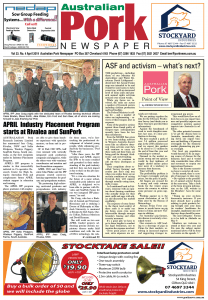 Since 1984, Brendon Cant has provided public relations and media services to Australia’s pork industry, including the fresh pork, smallgoods, R&D and producer sectors. Mr Coward has over 40 years’ experience in the pork industry, including 10 years as managing director of Swickers and as chairman of the Burnett Pork Alliance. Currently, Mr Coward works as a pork industry consultant and is president of Pork Queensland Inc.
Mr Haydon has had extensive experience both internationally and locally in a wide variety of marketing roles. Prior to joining APL, Mr Haydon was a director of marketing consulting. His primary expertise in this position involved demand creation, portfolio and brand strategy with specialist experience in consumer communication, category management, new product development and pricing strategy and tactics. In previous marketing positions Mr Haydon has had experience in developing brands for Kraft and Cadbury, creating and implementing sales and marketing global best practice for Lion Nathan and as general manager marketing for Cerebos ANZ. Stephan completed his PhD studies in 2007 at the University of Queensland, and is a chartered professional engineer with the IChemE for his professional engineering experience in wastewater treatment both in Australia and Hong Kong. Stephan has significant experience with biogas production systems, and relevant experience in the pork industry includes research assessing biogas production from spent pig litter. He now runs a support program for Australian pork producers wishing to harness energy from biogas at farm-scale, providing technical information on biogas and biogas systems. Alan worked as a water and irrigation engineer before moving into the intensive livestock field in 1994, initially providing technical direction for the assessment of cattle feedlot and piggery developments. Since 2001 he established a dairy environmental extension service and has led several research projects focusing on improved piggery effluent management and model development. From 2009 he led three Australian Methane to Markets in Agriculture projects investigating the collection, treatment and use of biogas from a covered anaerobic lagoon at a commercial piggery. With Pork CRC funding support, he is completing a Masters degree through the University of Queensland, evaluating and developing practical, cost-effective biogas treatment technologies suitable for adoption by the Australian pork industry.